Some of you have already started to enjoy the fruits of Sarah's furniture assembly labor in the form of the new weightlifting shoe cabinet at Arena Ready. The little blue boxes are for AR members who have weightlifting shoes (which ideally see some regular action) and would like to leave them at the gym. Instead of charging folks for the boxes and/or storage term we simply ask that you help us keep the cabinet clean, tidy, and odor free. 1) Write your first & last name clearly on the box with a Sharpie. If I don't know who it belongs to I'll donate or throw out the contents. Requests to bring in your own (non-matching) box will be politely declined. 2) The box should close completely and maintain it's original dimensions and shape. I'll donate or throw away anything not physically inside the box or causing the box to protrude like your next door neighbor's annoying crabapple tree. 3) If I identify anything smelly coming from your box (insert juvenile/asinine chuckle here) I'll throw away everything inside of it. I reserve the right to not have to tell you beforehand since the stench should have been your warning, and perhaps at that point you need a wake-up call or intervention anyway - for more on the topic, including solutions to personal odor problems, click here and read this. 4) Please no contraband or anything alive inside the box (see #3 above for anyone who thinks it would be funny to leave a bottle of kombucha in their cubby). 5) If you're tall use one of the higher shelves. If you're short use a lower shelf. If you're just plain ol' average height then remember that I care about you and that you have other special, unique qualities despite your middle-of-the-road stature. You know, just try to keep in mind the concept of other people. 6) If in doubt, always default to the simple question: "If everyone did what I'm about to do, would the system work?" I'll give you a hint - if you're asking yourself that question the answer is probably "no." So take the rest of that stuff with you when you leave, homeslice, because we love you but we don't necessarily love your gear all over the place. As a matter of fact, let's go ahead and make Rule #6 apply to the ENTIRE gym in general, and not just the weightlifting shoe cabinet. Please take your stuff home with you, folks - clothes, shoes, workout accessories, dog toys, personal grooming products, water bottles, bicycle parts, small kitchen appliances, children's toys, random home gym equipment castaways that you think "maybe somebody could use someday", unwanted baby hand-me-downs, Tupperware... ok you get the point. And yes, those are all things that get left at the gym more regularly than you'd think. We endeavor to organize official clothing swaps (and other types of gear/stuff/goods swaps) at the gym with specific instructions and timelines so that our community can take advantage of the generosity and thoughtful contributions of its members. So let's kindly try to reserve bulk exchanges to when we're able to mobilize a concerted effort and specific community event. 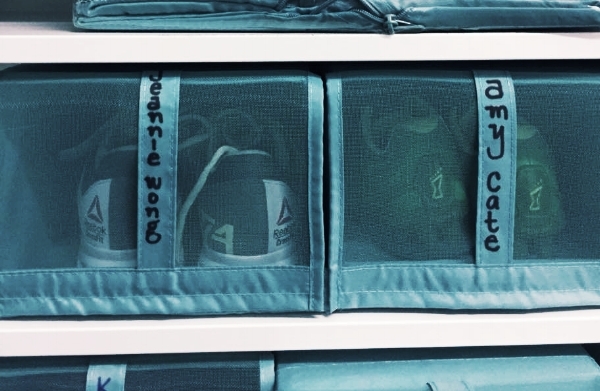 Here's to a tidy and organized fitness experience! Look how pretty organization can be! *For every meter over 250 when the counter stops, there is a 2-rep Wall Ball penalty (e.g. if the counter stops at 256m the team owes 12 Wall Balls). *For every meter under 250 the team owes the difference plus 5 AbMat Sit-ups (e.g. if the counter stops at 247m the team owes 8 AbMat Sit-ups). The penalties accumulate and must be performed at the end of the 5000m row. The team's time includes the time required to complete the penalty reps, which can be divided/shared in any fashion with ONLY ONE person working at a time.